Over 35 million Americans each year are either blind or have some sort of visual impairment. Thousands of dollars are spent on assistance and thousands of hours are spent by caretakers for the handicapped. From stumbling upon everyday obstacles, navigating simple household/local routes, to misplacing essential items blind people require a friendly, automated, and wireless assistant for such everyday tasks. Deep Sight uses a camera module attached to a Raspberry Pi synced with an Amazon Echo to act as a wireless voice assistant glassware for the blind/visually impaired. 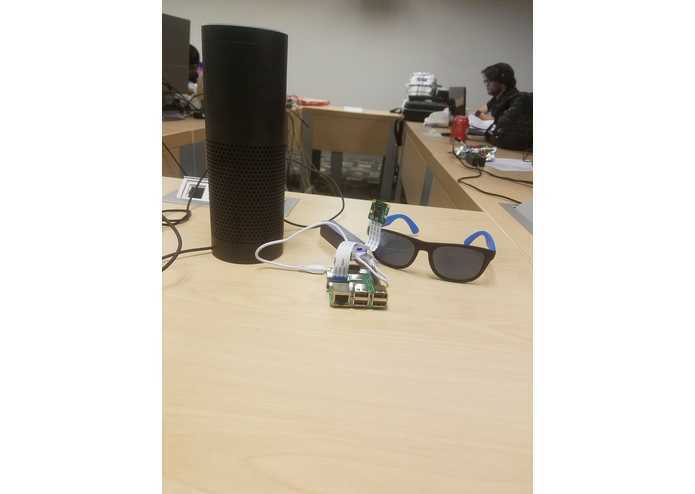 Users may hold objects in front of a camera module attached to their glasses/goggles, and Alexa will respond with image recognition and may be conversed with for further information about the object. The device uses OpenCV software for image recognition and Alexa Skills for a conversational UI. We originally wanted simple direct communication between Alexa and the Raspberry Pi. One of our biggest challenges was running the OpenCV software - a large file with many pre-trained images - to run on the Raspberry Pi. To overcome this, we send images taken by the Raspberry Pi to a local computer which has the OpenCV library, which is then analyzed and sent back to Alexa for communication. We're proud we were able to automate the entire process in a smooth, efficient manner. Integrating and connecting the Alexa, transmitting data through AWS in lambda functions and several SQS, communicatnto the raspberry pi, and then to the local computer and finally back to Alexa was a tedious process. We learned how to use raspberry pi functions, configure Open Computer Vision software, and develop a conversational UI with Alexa Skill sets. Extensions also include training the device to send emergency alerts when it senses dangerous home/public situations using either Google Cloud or other safety API's. For example, if the image recognition software recognizes a fire, it should immediately send an alert to 911 or firefighters. Next steps would be to include Machine Learning with our core analysis software which could make the voice-assistant more capable at detecting images and objects around the house and in public places. For example, instead of holding an object and inquiring the identity of the object, a user should be able to ask where in his/her frame is a certain object of interest.